Reports contain 3 years of data. The current ending year of our actual reports is 2015. This 3-Year Industry Financial Profile Industry Report helps you compare the overall performance of a specific Industry to the State and National averages as provided from US IRS data and more than 60 other sources. One year of actual data are shown as well as estimates of the most recent two years so you can understand the current trends in growth and economic environment. 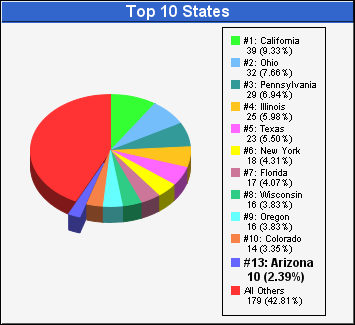 Business Counts: The table below shows the estimated number of businesses listed under: Copper Foundries, located in Arizona. 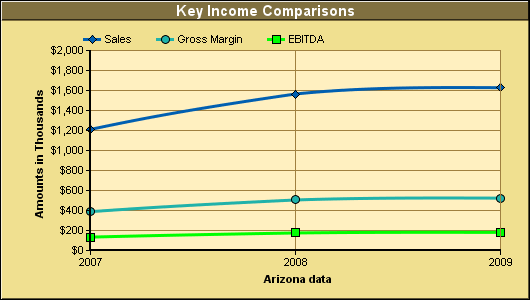 The chart below illustrates the key income values related to Sales, Gross Margin, and EBITDA (Earnings Before Interest, Taxes, Depreciation and Amortization) of the Copper Foundries industry during a 3-year period. In some cases, dollar amounts on this chart may overlay each other and a chart line may appear missing. Please review the Income Statement above to review these amounts. Positive growth trends are desirable. This chart may give a better growth view than Profits since many companies minimize Profits for tax purposes. 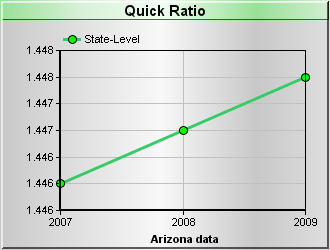 Quick Ratio (aka Acid Ratio): Short-term liquidity ratio calculated by dividing current assets (cash, marketable securities, etc. but not inventory) by current liabilities. This ratio places more emphasis on those liquid assets that can be quickly converted into cash. Generally, a Quick Ratio of 1 or greater is desirable and typically indicates that a company has enough cash on hand to pay its bills. This ratio varies significantly across Industries. Current Ratio: This ratio divides the current assets by the current liabilities (obligations to be paid in 30 to 60 days). This ratio is often used by short-term creditors to make sure that their investments are covered by assets which can be converted to cash in the near future. 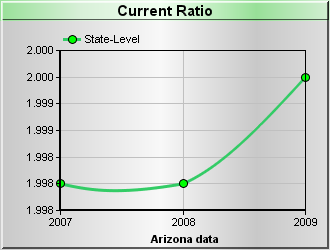 Generally, a Current Ratio of 1 or greater is good, a Current Ratio of 2 or greater is desirable. 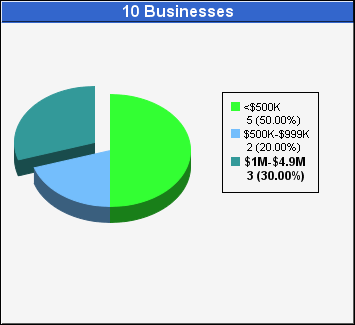 Amounts owed to your business for goods and services. The amounts allocated during the period to amortize the cost of acquired Long-term Assets. Debt due to be paid at a date more than one year in the future. The amount a company is reasonably confident that they can collect from their Accounts Receivable. These include items not otherwise classified as a Current Asset or a Fixed Asset. These could include property held for sale, long-term prepaid expenses or long-term notes receivable. A balance sheet entry used by companies to group together current liabilities that are not assigned to common liabilities such as debt obligations or accounts payable. Companies use short-term investments to park their surplus Cash. These investments could include securities bought and held for sale in the near future to generate additional income. What a business has of value. This includes: inventory, investments, bank accounts, cars, trucks, property, trademarks, goodwill, etc. Claims to the company's assets that are usually due within one year. These make up several line items, such as accounts payable, notes payable, current maturities, and accrued liabilities. Also called Current Liabilities. The owner's total investment in a company (purchased or earned), which may never have to be repaid, minus the liabilities that will need to be repaid. Is the sum of all liability items and the net worth. Also known as Total Assets. An accounts receivable which is considered uncollectible and is being written off. The direct cost associated with producing or acquiring the goods sold. The amount spent providing benefits to employees. Amount paid to service a debt. The amount remaining after all operating expenses have been deducted. The amount paid for occupancy and use of real estate. The amount paid to employees. The gross sales less any returns. Short-term liquidity ratio calculated by dividing Current Assets (cash, marketable securities, etc. but not Inventory) by Current Liabilities. This ratio places more emphasis on those liquid assets that can be quickly converted into cash. The information herein is furnished in confidence for your exclusive use for legitimate business purposes and shall not be reproduced. Neither Experian, primeIndustryReports.com nor its sources or distributors warrant such information nor shall they be liable for your use or reliance upon it.